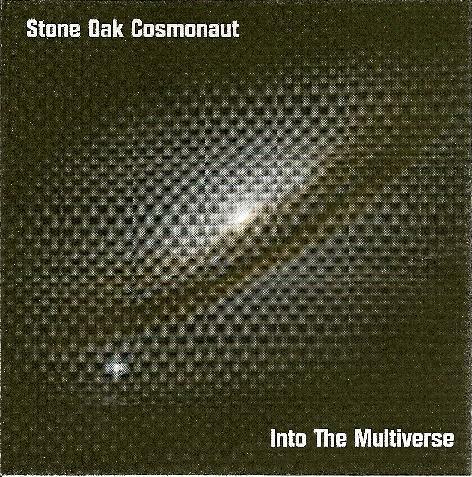 Stone Oak Cosmonaut - "Into The Multiverse"
I described Stone Oak Cosmonaut's 2008 debut as a monster blend of Space Rock, Metal and Stoner Rock, and I'm pleased to report that their sophomore effort - Into The Multiverse - is as gloriously monstrous as the first. The Dutch trio still consists of Peter on drums, Fred Stack on space guitar, and Edwin Von Trippenhof on bass, electronics, synths and vocals. In the letter that Von Trippenhof included with the CD he describes it as a sort of 2112 meets Space Ritual, and I'd say that sounds pretty accurate, though I'd throw in a dash of Motorhead and general 70s heavy rock and metal. The album includes 4 shorter tracks and the 7 part, 38 minute title track. The album opens with She Is My Interstellar Cow, which is pure stoned space-metal with swirling, bubbling, soaring electronics. This song melts seamlessly into the next track, Cosmonaut No. 6 (Valentina Tereshkoval), which is darker, more intense, and more thematically complex. It's got a cool jam section too. And Fly Into The Light and Telescope both have a punk-ish feel. But the album is dominated by the Into The Multiverse suite, which is something of a space-metal rock opera. It opens with freaked out electronics, spacey synths and crunchy power guitars. 70s metal blasted completely into space. But it's not just 38 minutes of relentless assault. There's lots going on with plenty of twists and turns. There's a soundscape interlude in the third part of the suite that provides a breather. This then develops into a quiet song that slowly builds up until blasting off again in the next section. Lots of great jams and Von Trippenhof's vocals fit this music perfectly. Most of the Into The Multiverse flows continuously so it really plays like one full ALBUM. And Stone Oak Cosmonaut do a great job of maintaining a sense of continuity and handle transitions fairly seamlessly. Another killer record that I give a highly recommended thumbs up to. Stone Oak Cosmonaut are finally back with their second CD. Their first one was one of my favourite records in 2008 and really blew me away. The new one features the same three piece line up with Edwin taking on the bass, vocals and electronics. The CD starts off with She is my Interstellar Cow and is a 6 minute track that will remind you of where the band left off with the last CD. Powerful metallic riffs but within the space rock realm. Fly into the Light is a short piece that leads into the 38 minute title track that is broken up into 7 parts. Edwin described this as their merge of Rush's 2112 and Hawkwind's Space Ritual! Anyway, it is an amazing 38 minute journey with very heavy parts, very spacy parts, but always interesting. Cool track. Telescope ends the CD with a 4 minute blast. Another very cool CD. I highly recommend it if you like heavy space rock style stuff.